Thanks to digital books and tablets, it has become much easier to carry our books, and large collections of literary works are no longer impossible to take with you. However, if you lean towards the traditional, physical copies of books are still an option for those in love with the smell or the sensation of rubbing fingers against pages while reading. Jorge Luis Borges said, “I have always imagined that Paradise will be a kind of library,” and we agree with him — but in order to stack our own Paradise, we need help carrying our books. Let’s start with tote bags. Wearing a tote bags is like being in a secret club. Tote bags are an expression of our unique voices and interests. Through them, we silently tell the world who we are and what we believe — plus they help us carry books and our daily needs. Style aside, we can carry a message, too. 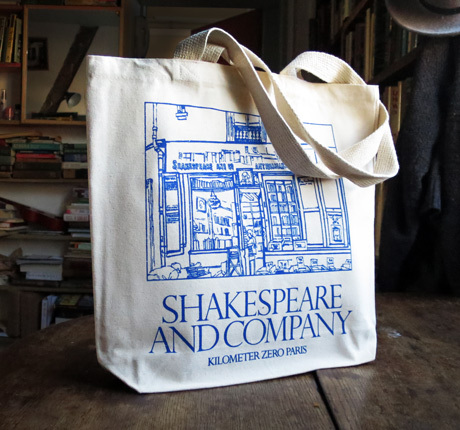 A tote bag can be a perfect way to support our local bookstores or local artists. Although we wish we could carry an entire Paradise in our hands, we can definitely carry some books thanks to these. This tote bag designed by Benjamin Critton for Printed Matter, a non-profit organization based in New York dedicated to showcasing artists. The tote bag boasts a powerful message: BOOKS IS POWER. We agree, knowledge is power, and books, too. Literary Hub is a one-stop shop for all your needs. 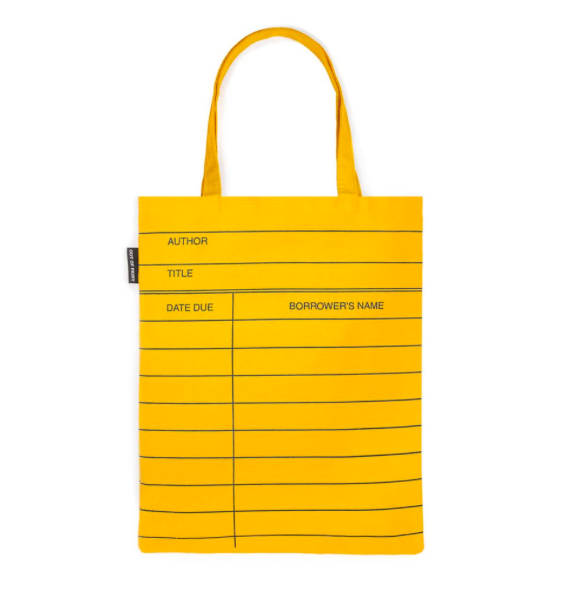 To celebrate books and literary culture, you can carry all your belongings and books in one of the tote bags beautifully graced by Joan Didion. Best thing about this tote bag: IT’S FREE. To get one, you have to follow Literary Hub across social media verticals and participate in their giveaways. Shakespeare & Co is an English-language bookshop in Paris — a classic bookstore nestled in the corner of narrowed streets overlooking Notre Dame and the Seine river. The tote bag illustrates the classic shop façade. Gertrude Stein would spend her time at this bookstore! From mugs to t-shirts and tote bags, Out of Print is a hub for book-inspired apparel and accessories. One of the many ways to pay tribute to your first love: a library card. 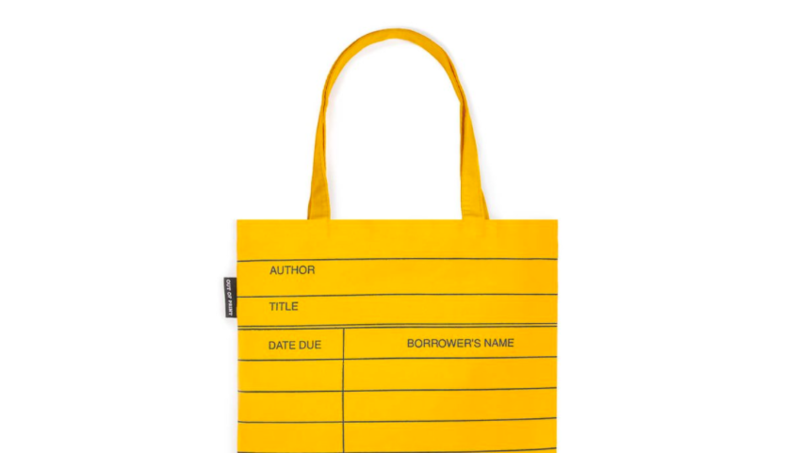 Out of Print has a library card tote bag that is a classic must-have. Los Angeles has its own paradise, too. Skylight Books is a hub for talks, gatherings, and books. Also, a dream space: a beautiful tree grows in the middle of the bookstore. Skylight Books has a tote bag highlighting the wonder of its store. More than a bookstore, it’s a landmark. City Lights is a bookstore that has helped shape culture. It is a space for people to gather, read, and be informed. Its tote bag pictures the iconic storefront in San Francisco. It’s not necessarily a bookstore, but Masa has tote bags created by Colombian designers and artists. As an allusion to the Colombian peace treaty, Masa released a tote bag reading: if we have peace, we’re great; with a play on words about peace and bread. Grab your tote bag and join the secret club of your choice!